Complete rewire of the DC and AC electrical systems. Both alternators replaced with new drive belts. Engines serviced 2017 and April 2018. Recent turbo and exhaust lagging. Recent engine bay blower motors. Recent fuel gauges and sender units. Recent engine stop cables and engine hour meters. Recent exhaust gas temperature alarms. Recent stern gland greasers and lines. Cockpit conversion (marine ply and epoxy). Complete repaint of hull, and top sides. Heavy duty, military specification, copper fuel tanks installed, with additional wing tanks for increased endurance range. New engine boxes, sound insulation and fireproof inspection hatches. New stays to wheelhouse hatch. New Vetus plastic water tank, plumbing and hoses. All seacocks replaced with new bronze units below the waterline, except raw water military specification bronze date valves and strainers. Windscreen washer kit and new blades installed. New hull and shaft anodes. Rebonding system, with new electro eliminator to starboard shaft and port side, serviced. New fireproof upholstery August 2017 with new foam (except forecabin). Refitted interior, headlining (all with 35 mm fireproof insulation and side lining. New Jabsco heads, hoses, anti-syphon valves and bronze seacocks. New sink in heads, with new mixer shower and taps. New, diesel, 1.5KW, hot air cabin heater fitted. As new, Nelson Spinflo cooker. New hot water calorifier (August 2017). Recent Lofrans, manual anchor winch. 8mm chain and 16mm, 3 strand warp. Recent Plastimo Offshore 115 heading compass, also a Nasa Fluxgate compass. Raymarine Ray52 Dsc vhf radio with internal Gps and recent aerial. Recent navigation lights and LED anchor light. New escape hatches to forecabin, aftcabin and saloon. 3 recent, large capacity bilge pumps, hoses, anti-syphon valves and bronze seacocks. 6 person canister life-raft serviced June 2017, with new cradle Hru. Recent stainless steel radar and aerial mount. Recent Ocean safety radar reflector. Recent horseshoe life-rings, lights drogues and heaving lines. 7 x Recent fire extinguishers (inc 2 auto in the engine bay, 1 x diesel heater automatic), with safety and service certificate 2018. Recent, Pilot single sensor gas alarm, CO alarm and smoke detectors. All engine bay hoses to Iso 7840 fire resistant standard. This boat is a well maintained version of these robust and well known vessels. Commonly used for work, this one was initially owned by the Royal Navy, but throughout its life has moved towards more commercial and leisure use. It is currently Marine and Coastguard Agency Category 2 coded, which expires June 2019. This is therefore a versatile craft, with numerous avenues of potential and would be suitable for the sea, inland waterways, canals and even as a small liveaboard. The boat is currently owned by an experienced, commercial skipper and marine engineer, who has carried out an extensive refurbishment, between August 2017 and July 2018. This refit has included conversion of the open, centre cockpit, to a covered cockpit, which can now be used with the sides open, canvas covered with translucent panels or fully enclosed. The boat is also complete with an extensive Inventory of navigation and safety equipment, much of it recent. This boat would be suitable for anybody looking for a versatile, well maintained, reliable and rugged power cruiser that has a classic look and pedigree. 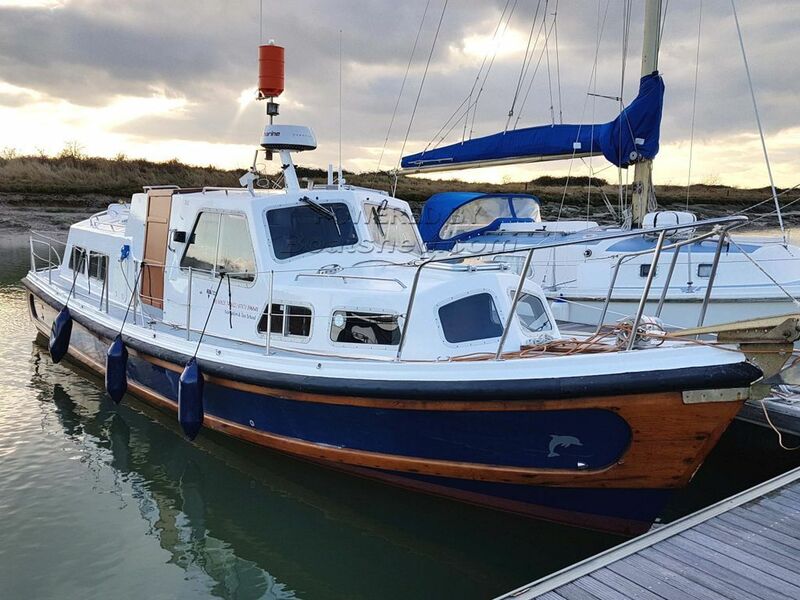 This Nelson 34 Aft Cabin has been personally photographed and viewed by Jayne Markham of Boatshed Essex. Click here for contact details.